This entry was posted in Champions on October 18, 2018 by Anthony Templer. Hallelujah Bey+// proved himself to be one of the top English Pleasure stallions. With limited appearances, he gained an outstanding show record, including two National Top Tens, one Scottsdale Top Ten, and ten Regional wins in open English Pleasure. Across the country, trainers, breeders, and fans are impressed not only with his talent and beauty, but with his superior, dynamic attitude both in and out of the show ring. 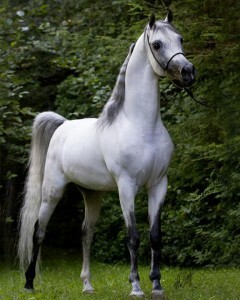 Bred by Varian Arabians, Hallelujah Bey+// has an incomparable pedigree, one that combines the Arabian breed’s most noted Park and English Pleasure bloodlines. With eleven National winners or National winning producers in the first three generations of his pedigree, his show ring victories and breeding success stories were very predictable. This entry was posted in Champions, Stallions and tagged progeny on October 15, 2013 by Anita Enander. Sold sight unseen from the fields of Maplewood, the incredible Gitar MF became a Canadian National Reserve Champion Stallion and sire of multiple National winners for Adandy Farm with Cathy Vincent. Maddox Van Ryad’s journey to Maplewood has been an international and hard-earned travelogue. From the moment we saw him at Gemini Acres 2012 private presentation, he had captured our hearts. His confidence, presence, and quality make him unique. Everything about him is just a bit apart from the norm. Perhaps he is a watershed horse whose influence can move the dial up a notch into the future. He’s tall; he STANDS tall. He looks down on his handlers with quiet grace; thoughts of a King’s mount cross your mind. He would be the one a royal rider might select from the herd. The perspective from his withers forward is unmatched – a most beautiful line of arched neck leading to chiseled tipped ears. His intriguing eyes penetrate yours. Legs – long and correct – support a worthy, smooth, and finely cut body. The cumulative form to function is perfection. Maddow Van Ryad wins Liberty class at 2014 Scottsdale Arabian National Breeder Finals. After earning US and Canadian National Reserve Championships, a Brazilian National Championship, a Perfect Score in Scottsdale Liberty and SEVEN Regional Championships. After a great lease period, we purchased Maddox in 2014. We are thrilled to have him as a permanent member of our stallion band. He will be bred to almost half of our small mare herd with hopes of imparting his traits as a beautiful athlete, gifted with a most interesting pedigree, into our program. 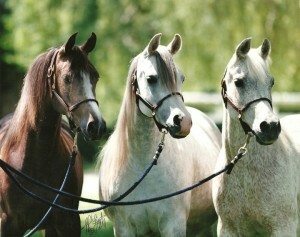 Three times Morafic through *El Shaklan and Shaikh Al Badi with an line to El Magato, Maddox comes by his motion honestly and from sources Maplewood has yet to tap; *Ali Jamaal offers classic Arabian hints to his appearance and his maternal grandsire AAF Kaset brings a touch of Polish as a catalyst. Maddox is already making a mark here at Maplewood. 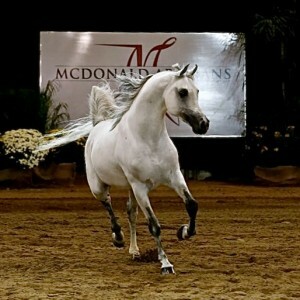 His 2014 daughter Madison MF (x Benraz Magnifique) was double champion at Region IV, winning both Champion Arabian Yearling Filly (unanimous) and Champion Arabian Yearling Filly Breeders Sweepstakes.